Happy New Year! If you are like most folks, you want to start this year off right when it comes to your training and nutrition. January is the time when many people get sucked into starting some fad diet to try to work off the Christmas cheer. While I’m all for making good nutrition decisions, if you are not careful, you may hurt your long-term process, spend too much money or make good nutrition (something that is already challenging) harder than it has to be. 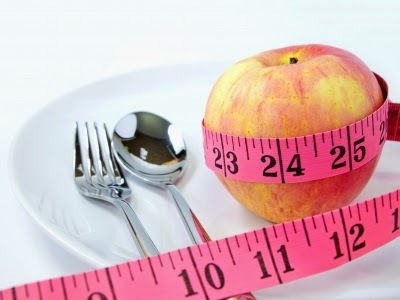 Before you start another diet, it is time you know the truth about diets. For decades many people have gotten all excited about rapid weight loss with some silly extreme crash diet. Lately people also get all excited about some trendy new cleanse. If you do something extreme, you will quickly drop scale pounds. For example, if you were fasted for a day or two and then stepped on the scale, you will have lost weight. Extreme diets and cleanses trick people by causing a quick loss in water weight and glycogen (stored carbs in your muscles and liver). Always remember that if you want to lose weight, what you really want is to lose body fat. I really get irritated with diets that require buying special pre-packaged foods. These diets not only cost a fortune, they also prevent people from doing what they really need for long term successful fat loss – to learn how to cook their own fat-loss appropriate foods. If you want to write a New York Times best-selling diet book, you need to have an angle. Imagine trying published with a book called “The Simple Diet: consistently replace junk food with real food, watch less TV and move more.” While this would solve the obesity epidemic, it likely won’t get you a book deal as it lacks the eye-catching quality books such as “Wheat Belly”. Rather than doing the simple things people already know they should do, they bounce from one fad diet to the next hopping there is some magical secret to stripping fat off them without changing anything about their fat-inducing lifestyle. With today’s diet fads people love the ultra-restrictive diets. It seems you can only eat something if it is raw, organic, non-GMO, gluten free, fat free, carb free, taste-free, grown within a block of their house and picked within 15 minutes. Okay, I know I got a little carried away, but please don’t miss the big picture: while there are some good principles in many of these diets that can be good for your health and the environment, you also run the risk of unnecessarily restricting your nutrition. Yes, this can work, but it makes nutrition harder than it has to be for most people. For example, many people think are into the gluten free diets these days. While there are people who should completely avoid gluten (e.g. those with Celiac disease), there are a lot of people out there who think they can’t eat gluten when they really can. Some people go on a gluten-free diet and lose weight – must be the gluten right? The most likely cause for weight loss on a gluten-free diet is that when the average person removes all the gluten foods from his/her typical diet, he/she eats less and as a result loses weight (unless the gluten-containing foods were replaced it with those highly processed gluten-free mock health foods). Excessive restriction is especially problematic for those doing a lot of hard training. Everything works? Well, not quite - some diets are better than others, especially as you move to greater levels of leanness. However, if you remove the really stupid weight loss gimmicks, you still wind up with a problem: how can you have all these seemingly so different diets all helping people lose fat? You talk to one person and he/she had success going vegan. Talk to another person and his/her success was the result of going Paleo. How can diets that seem to be polar opposite both deliver effective results? The truth is that while many popular diets appear to contradict each other, they all have 4 common ingredients that are the most important things to do when it comes to losing fat (see next point). 1. Better than “normal” North American Eating. The typical North American diet is almost engineered for fat gain. All successful diets, even ones that are really bad are usually better than how the typical North American eats. 2. Eat less junk. Every successful diet has you eating less junk. Even those that allow you to have a cheat day still have you on the whole eating less junk that the average person usually eats. 3. Reduce total calories. By eating less junk, you reduce total calories. 4. Eat more vegetables. High carb, low carb, vegan, paleo and countless other diets all get you eating more vegetables and this improves your health and your body composition. 5. Discourage eating high carbs with high fat. Even low fat, high carb and low carb high fat diets share and important common message: do not eat a meal that is both high in fat and high in carbs. The best way to gain fat is to pound back a huge amount of fat and carbs in the same meal. The most fattening foods (e.g. baked goods, fast food, etc.) is usually a combination of refined carbohydrates and junk fats. At this point in the conversation I think I literally stuck my tongue out and bit down. One look at the staggering obesity rates in North America should be ample proof for anyone that “normal eating” on this continent makes you fat. Diets don’t work long term because people only use them short-term. To most people, a diet is a short, miserable period of deprivation followed by a return to “normal eating” which is what made them gain fat in the first place. You have to want to be lean more than you want the foods that make you fat. The world is filled with people who are obese and would like to be lean – but not as much as they like their favorite fattening foods. Nothing short of a permanent dietary change will create permanent fat loss. between what you eat and your goals. Look at your 3 day food log and make a list of all the things you eat or do not eat that would make you gain fat. Check out the nutrition posts on the blog for more help with this as needed. Prioritize this list – what is the worst of everything you are doing? Start with item #1 on your list, make a change and stick with it until that change feels normal, then work through the list. If you want some ideas for making gradual, sustainable nutrition changes, check out my 52 Weeks to Better Nutrition and a New You series. Keep your food journal going (either with a notebook or an app for your phone) – it will help you to think more about what you eat and allow you to track your dietary changes. If you are interested in fat loss, check out the many fat loss posts I have written on this site. 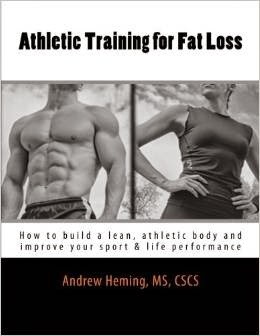 For a complete guide to building your own customized diet and the optimal way to train for fat loss, check out my book, Athletic Training for Fat Loss.